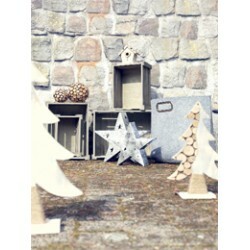 A wonderful scenery with the church, the house and the market stall made of detailed cut-out plywood.. The traditional Christmas pyramid with illuminated inner foot and rotating colourful characters. The..
To make your Christmas tree a spectacular home feature this festive season, we have an abundance of ..
A beautiful wooden tray with metal candle holders. A nice decoration opportunity for individual arra.. Glittering starlights! This special star shines in an impressive tree pit look. The LED lighting giv..
Set of 4. Happy faces, small bells and felt blankets with wooden stars adorn these red varnished woo..
Set of 2. Woven balls and pine cones with decorative "snow" are connected to hanf. This hanging deco.. This large illuminated shabby chic Christmas tree creates a cosy atmosphere in the home. Integrated.. This small illuminated shabby chic Christmas tree creates a cosy atmosphere in the home. Integrated .. Wonderful Christmas time! These three cream-coloured LED candles in different heights shine without ..
With nice effect: Switch on the silver LED lights and see them sparkling through the half-transparen..